Turn a Picture into a Website with Free Image Map Tool – CSS Support Too! I’m currently working with a company on the Utah Genius Website. I needed a layout quickly, as our invitations were about to be sent out. The company had used photoshop to do a proof of the layout, and we had settled on a good front page. They gave me the JPG to use as a placeholder while they created the HTML and CSS. So I put up the image and dreaded making an image map for it. Luckily, I found a tool that would do HTML or HTML & CSS image mapping for me. Its called image-maps.com. It was quick, could work off of an online or uploaded image and gave me the code to modify at my whim. They requested a donation, blog post, and link back. However, none were required. I decided to give the blog post (this post) and the link back, as its unobtrusive. If you’re like me, you discovered that the compatability pack for Office XP broke sometime earlier this year. You can’t open DOCX or XLSX files from outlook. You get a strange bunch of errors when opening DOCX and XLSX files and end up opening a file with a strange name in the temporary directory when it works. find and install a prior version of mso.dll (not recommended). As to option 2, rolling back the update can be difficult, because I couldn’t find the update. I didn’t dig, but it may be included in a service pack or corrected by another update. As to option 3, I don’t recommend it because dll’s frequently have to be registered on the system. A find and replace could have very bad effects on your office – even breaking it. MS replaced mso.dll in the update. However, as far as I can tell, permissions in Vista are messed up. The program does not have the ability to fix bad registry settings and so ends up in a bad state. The workarounds that I’ve been reading about sound arduous and annoying, if they work. As Office XP is 8 years old, I’m guessing good old M$ doesn’t care if the old version is broken. 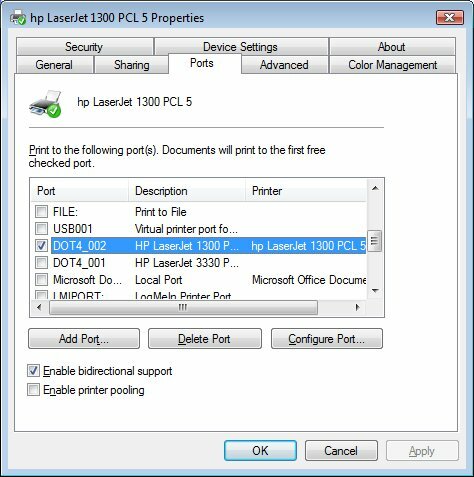 Fix: Change the Offline Printer’s Port to an Online Similar Printer’s Port. As far I can tell, you can’t move the file / print job. You can just trick the spooler to use a different port which is connected to a different printer. Find a printer that is the exact same model (or very, very close). Connect it to the computer and get it set up. Go to Printers in the Control Panel. Right click on the new Printer and select Properties. Right click on the offline printer and select Properties. Watch as the Print comes Out! Problem: I had a friend who had printed a success page from a web page that he submitted very important documents. Unfortunately, he exited the browser before he made sure the printout came out. Worse yet, the print was assigned to an offline printer that no longer existed (we replaced that printer a while back). His print job was stuck in an offline printer spooler with no place to go. He wanted to move the print job from one printer to another printer. Connect the drive to a friend’s laptop (or a sympathetic lab administrator) and ask them to access the files. The person must have Administrative Rights on the computer. Almost everyone’s personal laptop account has administrative rights. My brother’s friend’s computer just up and died at Stanford. He had an article due and was sweating that he couldn’t get it back. He did everything right. He got an external hard drive enclosure and put the drive in the enclosure. He went to the library and hooked it up to a computer. He tried to go into his “G:\Users\USERNAME\Documents” folder (in Vista and 7 – in XP its G:\Documents and Settings\USERNAME\My Documents”). However, he got the “Access Denied” error when he tried to go into “G:\Users\USERNAME”. 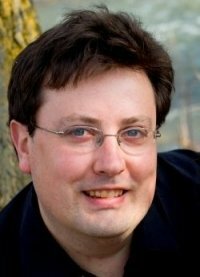 He was logged into a library computer as a “User” or a “Power User” without administrator permissions to files. The files on his hard drive belonged to “USERNAME” on his laptop and not to “SCHOOL USERNAME” on the school computer. Thus the library computer was respecting the file permissions. So why doens’t this problem rear its ugly head with a jump drive? I think its because removable media is marked as for everyone. My guess is that User folders and system folders are the only ones protected. when I tried to click on the links. Here’s the problem: When Godaddy transferred my files to the new server, they did not update all the DNS entries and gave standard file permissions. Check the DNS entries to make sure they have the new updated IP Address associated with your hosting account. (If that just sounded like “Blah, Blah, Blah”, ask your geek friend for help – as that would take quite a few steps to lead you through and Godaddy continually updates their interface). If the DNS entries are correct, check the file permissions. Make them 775 or 774, depending on your risk level (775 is more likely to work, 774 is more safe, 704 is even more safe). Highlight and right click on the server files in Filezilla, if you use it. Angel Investor of the Year just announced their top 15 finalists. We’ve been hearing a lot of hoopla about Verizon getting an iPhone. After reading a few articles like the one on engadget. I’m thinking that AT&T is losing exclusivity to Sprint. I was wondering why AT&T would be removing its unlimited access plans and upping its termination fees. And why would they extend an olive branch to iPads before June 7th? Here’s what I’ve come up with: AT&T sees the writing on the wall and wants to lock users in. What better way to create lock-in than make the unlimited plan go away, but leave current users “grandfathered in”. Personally, I kind of find that action desparate and despicable. If my assumptions are true, than AT&T views its customers more like sheep to shear rather than a value-added partner. But I don’t run in the AT&T circles. Why do I think its Sprint? Go to their website and click on the guy on the bench – the one that says “make your iPhone 4G.” Now you might think “so what? they’re just using a 4G router,” but Sprint has no interest in reminding you that they don’t have the iPhone. They want you to think of all the cool phones they have. Seriously, they have good marketing people. So I think it must be a primer for their iPhone. In all, its still a guess. But we should find out soon. Let’s look to next weeks WWDC and find out!